I love making these coffee cozies! Whenever I buy coffee I always snag a cup sleeve to keep from burning my fingers… These work better than those cardboard disposable ones, and are much more environmentally friendly. They work up really quickly so I’ve made about a dozen to give to my friends. Enjoy! Note: Even though these are washer- and dryer-safe, I’ve noticed that the colours fade when they’re put in the dryer, so it’s probably best to air-dry. These cozies look really good with multicoloured yarn. Or, try a striped effect by changing the colour every few rows, or 3 colours (A for row 1-6, B for 7-12, and C for 13 & 14). Decorate your cozy with buttons or crocheted flowers. Sc 5 into a magic ring. Sl st to first st.
*Ch 3, 3Dc into first st, ch 3, sl st into same st. Sl st into next st.
Repeat from * in each of the next 4 sts. Finish off. 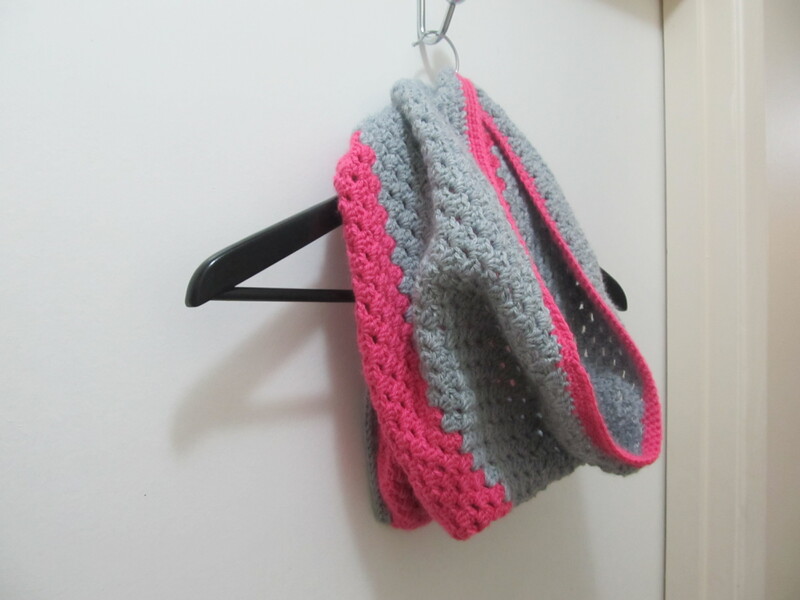 I was looking for a crocheted scarf pattern that would be suitable for men. After several failed attempts with patterns that were too thick and chunky-looking, I came across the solution: use a larger hook and a looser stitch. I was inspired by Crochet in Color’s Ireland’s Scarf, but instead of working the scarf lengthwise, I went width-wise and added ch-1 spaces. I have seen the “sc1, ch1, repeat” pattern called a granite stitch, but what is it called when the single crochet is replaced with an extended single crochet? I think it still looks pretty “granite-y”, but does anyone know what it’s proper name is? 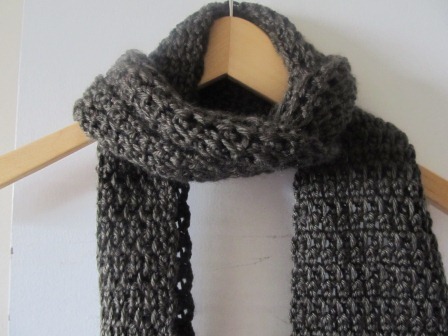 This scarf would probably work well in women’s colours too, I just find it discouraging how few patterns there are for men’s crocheted items. In my experience, the colours you choose really determine the ‘gender’, and I’ve noticed that masculine scarves tend to be wider and have a stronger boarder. Row 1: 1 Sc in 2nd ch from hook and in each ch across (25 sc). Ch 1 and turn. Row 2: 1 Esc in first st. *Ch 1. Miss next st. 1 Esc in next st. Repeat from * to end (13 Esc & 12 ch). Ch 1 and turn. Row 3: 1 Esc in first st. 1 Esc in next ch-1 sp. *Ch 1. Miss next st. 1 Esc in next ch-1 sp. Rep from * to last st. 1 Esc in last sc. (14 Esc & 11 ch). Ch 1 and turn. Row 4: 1 Esc in first st. *Ch 1. Miss next st. 1 Esc in next ch-1 sp. Repeat from * to last 2 st. Ch 1. Miss next st. 1 Esc in last st. (13 Esc & 12 ch). Ch 1 and turn. Repeat last 2 rows until scarf is desired length. To finish, crochet 1 row of sc in each st and ch-1 sp across (25 sc). Ch 1 & turn. Sl st in each st across and finish off (25 sl st).